Law is a very book-heavy subject; there’s no escaping it. Our students come out of university with a law degree and a bad back. Despite progress with e-books, the students’ fond reliance on textbooks and the publishers’ inability to find a pricing model that works has meant that most students can be found studying with an open laptop for databases and note-taking, alongside a Leaning Tower of Pisa constructed of books. There’s been much research around this, but largely we find that students see e-books as good to dip into but not for any prolonged reading. They scan rather than reading with deep reflection: the temptation to multi-task is overwhelming when reading a book online – see this article by Michael S Rosenwald in the Washington Post. It means something to see a page in your hands: students talk of recalling information according to where it was on the physical page in a way you just don’t experience via an unblemished digital page. Keeping our students engaged and interested in their studies can be tough. The front-loaded nature of a course where you are learning a new substantive subject, the skills associated with that, all the academic skills (writing at HE level, time management, note-taking etc), completing a large amount of reading and actively pursuing a career can be a big ask. Aside from face-to-face teaching and support workshops, universities will generally use their VLE or SLEs (Moodle, Blackboard) to deliver online support material. Because of the nature of these generic services and the pressures of time, it can be difficult to make content interesting enough to appeal to students, particularly when the subject area might be a little on the dry side. Directory. Links by topic area to useful websites. Hub. Sections focus on information core to our students: our e-resources, my Twitter feed, law school news, new books carousel and an events calendar covering events both at City and out and about in legal London. Learnmore. 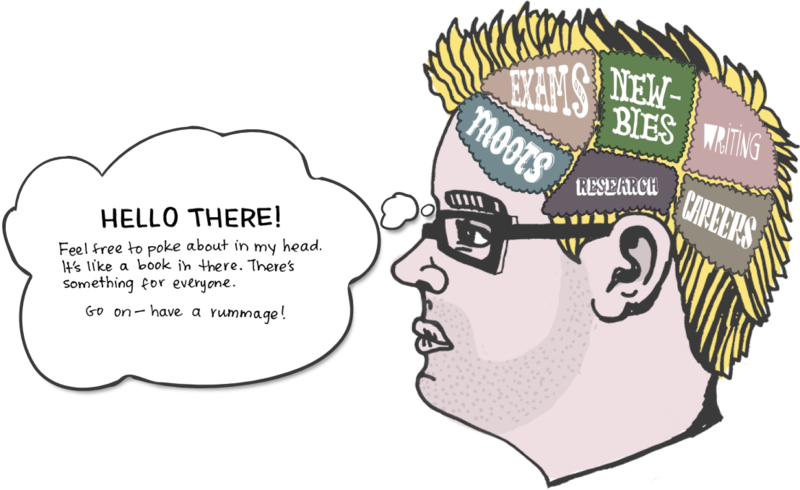 Built on a wiki, this is centred around a law student’s brain (see picture) and aims to provide various resources to help students with mooting, legal writing, research, exams and careers. Future Lawyer. A blog covering a broad range of topics offering everything from event reviews, interviews, news, profiles and insight into experiences (pro bono, internships, vacation schemes, mini pupillages etc). Mooting. This, unsurprisingly, hosts all the information we need to get out about moot activities of the school. What has struck a chord with students? In terms of achieving a high level of online engagement with our students, Lawbore seems to tick a number of key boxes. It matters not a jot how good your resources are if you can’t grab the audience’s attention. You can lighten the mood by how you write about something or the images you use to illustrate a piece. Often people feel that if it’s a serious subject you risk undermining your message by including humour – not something I’ve ever encountered. At a law school which offers legal education across the entire spectrum (LLB, Graduate entry LLB, GDL, LLM, BPTC and LPC), having a way of bringing that community together is of utmost importance. Students can (and do!) contribute content to Future Lawyer and enjoy seeing their work published as well as getting a buzz out of feeling they’ve shared their knowledge and experience to help others. We also get our alumni involved too. This year we planned a new induction exercise for our LLB students which involved them following some trails around London to find specific buildings with some connection to the law. This experience was then used as inspiration for a writing exercise – short blog posts sparked by their travels before asking them to peer assess each other’s efforts, and in turn addressing what we look for at university level. The best 21 posts were then added to Lawbore. Leading on from the community aspect, I work with students and others to collaborate on certain resources on both Learnmore and Future Lawyer. Some of the collaborations are mentioned just below. There’s a real emphasis on providing a range of different types of resource, partly to assist those varied learning styles but also just to keep life interesting. On Learnmore there is a wealth of videos, many the result of my collaboration with students; for example, on Mooting, Legal Research, animations such as the Law Student A-Z and talking slideshows too, alongside text-based pieces. In order to clarify the sections of a law report (always confusing for new students) I worked with Paul Magrath from the ICLR to bring this alive via our Anatomy of a Law Report resource. This is one of the most important aspects. Both Learnmore and Future Lawyer owe part of their success to the illustration which weaves the sites together – the student head of Learnmore and the quirky hand-drawn imagery make it very appealing. Similarly, when giving Future Lawyer a new lease of life at the beginning of this academic year, I had in mind a very specific design and style and found the perfect illustrator to make this happen. The site has a fabulous banner showing a busy street populated with legal buildings of all types. Also, choosing the right image to accompany a post can make all the difference. For Lawbore, there is always a huge “to do” list of improvements, additions and ideas at various stages of development. I am keen to concentrate on substantive subjects now and I am looking at ways in which we can use what we have learnt with Lawbore to create resources that will explain difficult legal principles or concepts in a way which doesn’t rely so heavily on text. I’m going to be working closely with students on this. Emily Allbon is a lecturer at the City Law School, City University London. She created and maintains Lawbore. She speaks and writes on both legal information management and legal education and technology issues. Her first book for law students, with colleague Sanmeet Kaur Dua, will publish in May: The Insider’s Guide to Legal Skills (Routledge). Email e.allbon@city.ac.uk. Twitter @lawbore.